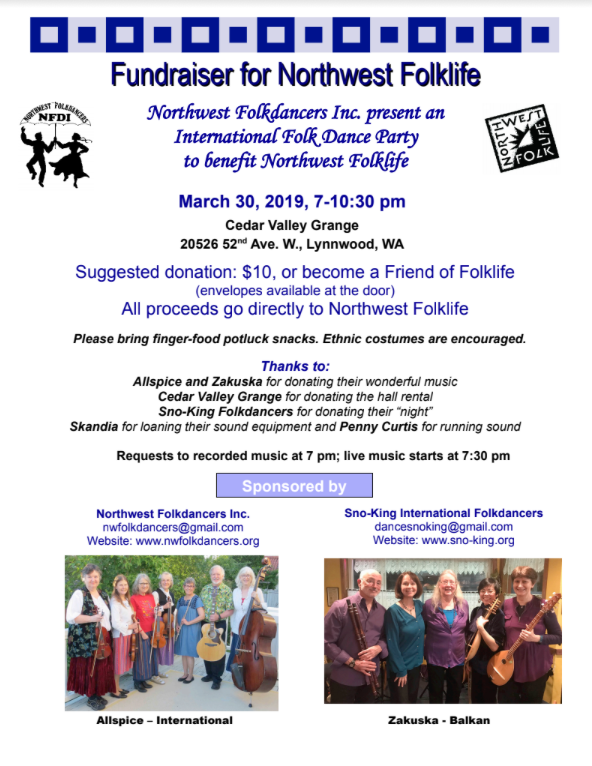 Northwest Folkdancers Inc. present an International Folk Dance Party to benefit Northwest Folklife on Saturday, March 30, 2019, 7 - 10:30pm at the Cedar Valley Grange, 20526 52nd Ave W, Lynnwood. Dance to the music of two bands, Allspice (International) and Zakuska (Balkan). Suggested donation $10, or become a Friend of Folklife at the door. All proceeds go directly to Northwest Folklife. The hall, the music, and the workers are all donated. Sno-King Folkdancers are giving up their dance night for this event. Please bring finger-food snacks. Ethnic costumes are encouraged. This will be the biggest International folk dance at the Grange this year. Dancers from a number of clubs will participate. You needn’t bring a partner, and there will be lots of easy dances. Requests to recorded music at 7pm; live music starts at 7:30pm. Email Northwest Folkdancers or Sno-King Folkdancers for more information.